Often I post things in this blog which bring back some serious memories good and bad. I don’t like to spill my guts all over this blog, but I remember that one of the reasons I initially wanted to do this blog was to document memories, and have a place of my own to go to when I am stressed out, happy, or just contemplating something silly like a new handbag purchase. I have to confess, I have a major source of guilt? sadness? that stalks me wherever I go. I woke up last night with a dream I remember vividly. It was a dream about friends. Specifically my former 3 best friends in the world. We met at different times in our childhood, but by the 9th grade we were stuck together like glue. Lisa and Camille and I were friends as far back as 4th/5th grade. Nancy came to complete our foursome in high school (she was a good catholic girl that spent grades K-8 in the local catholic school). From our friendship, we created a giant circle of friends around us. We became a group of 10 or more (girls and boys) and our circle of friends carried forward for many years… beyond high school… beyond college. The four of us, plus our merry band of friends… Laura, Amy, Jennifer, Kenny, Bobby, Brian, Keith, Tony, Darance, Dennis, Chuck, Rob. We were a group of diversity. Jocks and geeks. Bookworms and popular kids. Black and white. It was amazing how the differences drew us closer. We were like a band without instruments (except for our loud voices, which got us in trouble from time to time). 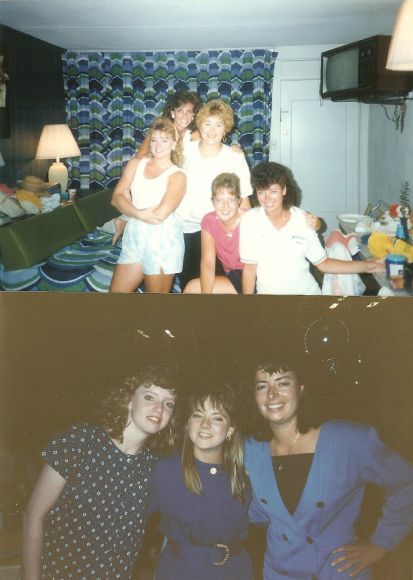 In High School, we had parties, went to the movies, went to theme parks, went to the shore. Most of us were the Class of 1986. We were kids of the 80’s. We listened to Bruce Springsteen, The Cars, Duran Duran, Journey, The Cure. It was the time of high hair, mullets, Jordache jeans, and day-glo sweatshirts (with the collar cut out of course, a-la Flashdance). When college came, we all went our separate ways. Lisa went to Rowan, Camille to Rutgers, Nancy to U of Maryland,… I went to LaSalle. Our other friends went away too, some to the greatest colleges/universities in the country. Some stayed home. It didn’t matter where we went, we always came home for the holidays and part of the summer. The “girls” had beach week in the summer. The guys always came down for a day to make sure we weren’t getting into too much trouble (and to make their own trouble). In the winter we always had a Christmas party at Camille’s house. Her mom would make the best spinach dip, and we would gather in the rec room to talk about all the exciting things we did during the school year. Someone always threw the New Years Eve party, and every year we’d open a (few) bottles of champagne and drink/toast the new year. The girls, usually me, Lisa, Camille, Nancy, and Laura., had a tradition that we started… I don’t know, maybe when we all got our drivers licenses… where we would go shopping every year on Black Friday. We never, never, missed that. We would drive to mall, blasting the radio and laughing and gossiping about everything. When we all graduated from college, some of us went into the work world, some went on to pursue MBA or doctoral degrees. Camille was in publishing, Nancy was in social work, Lisa and I still searching for what we loved. I ended up in technology, and Lisa did a myriad of jobs along the way. Nancy moved to New Orleans, and Camille to North Jersey. Which really just gave the rest of us an excuse to travel to see each other and find new mexican restaurants and cute boys. Eventually, we started to find significant others and marry. Lisa was first (age 27) and then me, in the same year. At first, it didn’t really affect our friendship, but as you might imagine… having a husband and other responsibility just added more to juggle. Lisa had a baby shortly thereafter. I remember going to her son’s christening party, and just thinking how different we all were. Something felt odd. As we approached our 30’s, there were fewer and fewer get-togethers, and one year (the year I turned 31) we didn’t get together at all for our Thanksgiving shopping tradition. Soon after, the phone calls dwindled, the birthday cards went unanswered. One day I woke up and realized that I lost my best friends. There was no fight, no one incident that changed things, we just drifted away. Years later, you would think that I would just look back at the fond memories. And I do, but to be honest, I feel absolutely awful that this happened. I feel like it’s my fault… that I should have been the glue to bring everyone together. I think about them often. I wonder what they are doing. Lisa and I saw each other maybe 2 years ago. She had another baby, a little girl… the same month I had David. We met for lunch and talked about how nice it would be if we could find the other girls and get together. We never did. I run into one of the guys now and then. I dated one of them back when I got out of college. Briefly, I was reunited with my guy friends, but they eventually disappeared too. It was hard to drift away from the outer circle of friends, but I knew it would happen eventually… I just never thought that the four of us would give up so easy. I was fully prepared to have a baby who would have an Aunt Nancy, Aunt Lisa, Aunt Camille to dote on him/her for life. No such luck. Why would we invest so much time only to lose the ones we love? Are they married, do they have kids? Are they nearby or far away? Questions I might never know the answer to. Which seems odd when you have been connected at the hip for almost 20 years. All I know is I feel like I lost my sisters. Every year, around Thanksgiving/Christmas I am reminded of them. Like ghosts. They invade my dreams every once in awhile, and in those dreams I re-live what was and what could have been. I carry this guilt with me wherever I go. Like a bad habit. I do think that it has impacted my relationships with other people. Often I find myself specifically not getting too invested in friends for this reason. It makes me sad. As we near the Thanksgiving Holiday, I remember my old friends. Every last one, but especially my “sisters”. So, if you are out there Lisa, Camille, Nancy (and the all the rest of you)…. I miss you. Jocelyn, I just loooove your site!!! Thanks for stopping by.